Over the past month, Visit Pensacola has been hard at work planning one of the largest events this city will see in a lifetime, launching campaigns and promoting our area to win USA Today’s 10Best Readers’ Choice 2018 Best Beach. Last week, Visit Pensacola announced the “Tourism Works for Pensacola” campaign, an effort that displays the impact of tourism in our community. As a partner, I ask that you lend an ear and a helping hand to pave the way for a brighter, more sustainable Escambia County. By familiarizing yourself with the listed messages, you can share valuable information and heartfelt stories that revolve around our industry. Click here for more information. As a reminder, Pensacola Beach and the Gulf Islands National Seashore have both been nominated for USA Today 10Best Readers’ Choice 2018 Best Florida Beach. Please continue to vote to help us win both first and second place. Vote daily at BeachVote.com. Finally, the Tall Ships® Pensacola festival is just around the corner. In preparation for a successful event, we encourage fans to purchase tickets ahead of time and to set a clear plan. For more information and to purchase tickets, click here. As always, my door is always open. If you have any questions, please feel free to stop by or give me a call anytime. The Pensacola Bay Area continues to stay top of mind in elite publications and media outlets across the country. Trivago named the area a top destination for boomer travelers to explore in 2018, Travel + Leisure named Pensacola to its 25 best Places for Comfort Food in the U.S. According to Yelp, and MSN.com named the area to its list of 20 Hot Spots in Florida to Escape the Winter Cold. For a complete list of story mentions, click here. To continue the PR efforts of the Pensacola Bay Area, the Visit Pensacola team traveled to Birmingham to meet with editors of several large travel publications to develop relationships for future story placements. Visit FL team will be live from Tall Ships Pensacola festival. Visit FL and six German journalists will visit the area May 6-8. In the coming months, we are working with several bloggers, influencers and editors from large publications to visit Pensacola. The Pensacola story is unlike any other. For every one of us it is unique, personal and even situational. Our spring campaign is underway, and we are sharing our experience with trip giveaways for a family of four in four key markets. These TV and Digital promotions can be seen in Dallas, Atlanta, Nashville and New Orleans. We know we are more than just the beach and are excited to host these guests and others while they share their stories and experience Pensacola, whatever that may mean to them. Mark your calendars for National Travel and Tourism Week 2018, May 6-12. Visit Pensacola will be hosting a variety of events to celebrate and pay respect to the industry, including awarding Hospitality Heroes. Visit Pensacola will officially kick off the week with its third annual Hospitality Olympics. 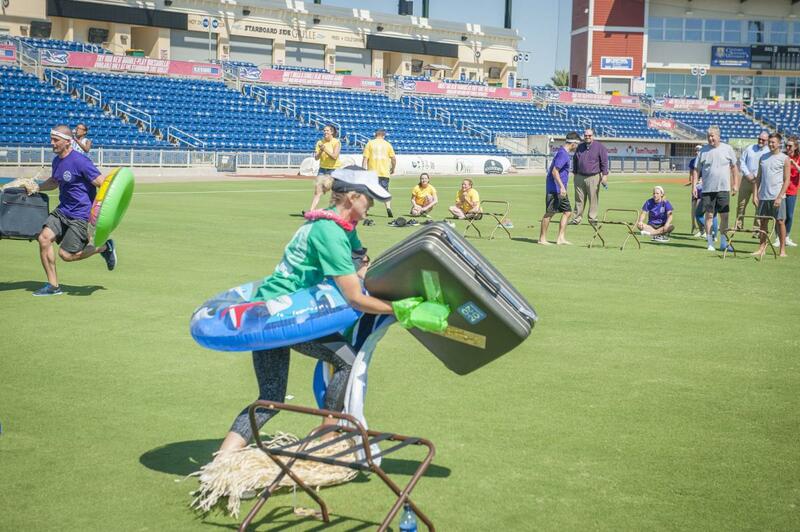 Set to take place from 8:30 a.m. – 11:00 a.m. at Blue Wahoos Stadium, all tourism industry businesses and organizations are invited to form teams to compete. Click here to sign your team up for some friendly industry competition. At the forefront of the industry, front-line employees are the driving force between guests and their experiences. To honor those that go above and beyond, please take a moment to read the Hospitality Hero Program criteria and nominate your best employees for the categories below, here. Deadline for nominations and teams is Friday, April 27, 2018. For questions or concerns, please email Leslie White at lbrosofsky@visitpensacola.com. IPW will take place May 19-23, more than 6,000 travel professionals and media from 70+ countries will meet during this three-day appointment show, to conduct future domestic, international, leisure, business, group, and individual, travel business. Last year, Visit Pensacola conducted 22 appointments with travel buyers from across the world. We are looking forward to this year’s meetings and will provide a full report when we return. Are you receiving our Event Snapshot? This is a bi-weekly preview of all the events on our calendar. Click here to see the events taking place and be sure to sign up to receive. Email Bwilliams@visitpensacola.com if you’d like to receive.